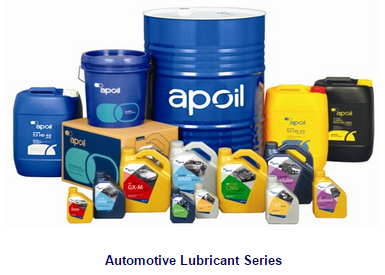 AP Oil International Limited, is a one stop solution provider for lubrication needs. It manufactures and markets lubricants and specialty chemicals products to some 20 countries. Some brief history. The group started as lubricant distributor in 1975, ventured into manufacturing in 1981 and listed in 2001. It acquired A.I.M Chemical Industries in year 2000 to expand into specialty chemicals who operates a chemical blending plant providing toll blending and contract manufacturing. The group has R&D facilities to provide customised lubricants for specific needs of customers and improve operational efficiency of cost effectiveness. Application for its lubricants are automotive, industrial and marine industries. Did you encounter any of the lubricants produced by the group before? The group currently operates 6 manufacturing plants. (3 for lubricants and 2 for specialty chemicals). Two lubricants plants are equipped with terminals and a private jetty. Acquired a lubricant plant with a fully equipped laboratory through established 30:70 JV company, AP Saigon Petro in Vietnam in FY2008. The plant has an annual production capacity of about 25,000mt, products being distributed through Saigon Petro's network of about 400 petrol stations and exported to neighbouring countries. Revenue of the group throughout the year was in upward trend but not a smooth one and dropped significantly in FY2013. Net profit was in the region of SGD4-5mils for the past 5 years. 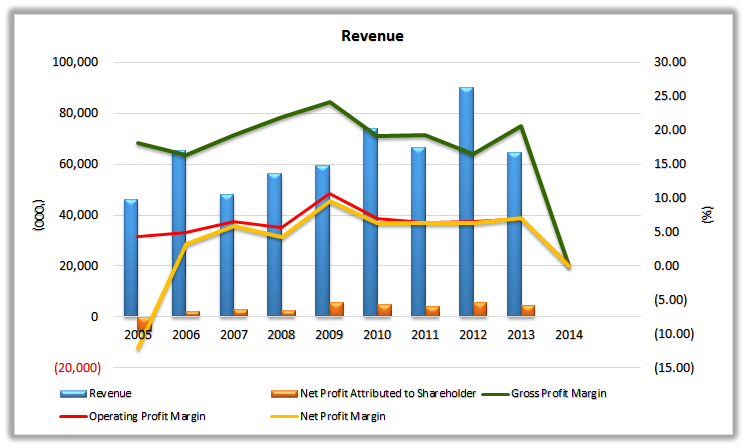 Gross profit margin was between 15-25% while operating profit margin and net profit margin were in the region of 7%. Typical chemical manufacturer with single digit profit margin. Dividend for the past 4 years were 0.5 cents. No increase no decrease. Payout ratio was below 20%. The group is in net cash position ever since FY2009. As in AR2013, all cash, receivables and payable are denominated in Sg Dollar. 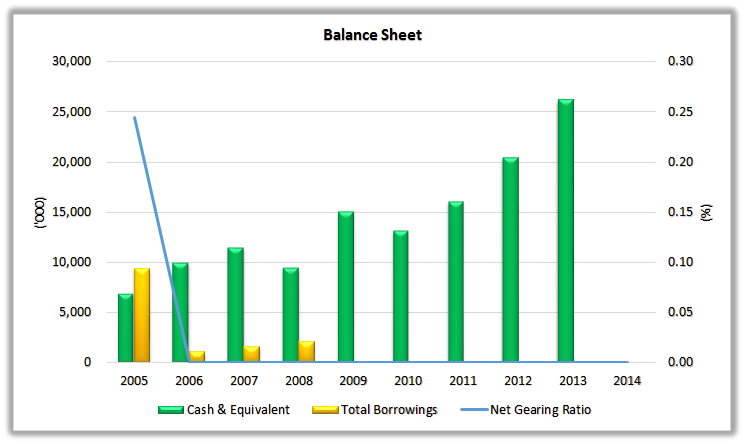 Cash balance is so high that it contributed around half of the group’s total assets. In addition, the group liabilities mainly contributed by the shareholders’ equities, in the region of 80%. Thus, all the invested capital comes from the shareholders themselves. Current ratio is also high at 4 to 5 times. The group balance sheet is so strong that able to survive any potential crisis and also make any acquisitions when opportunity arises. 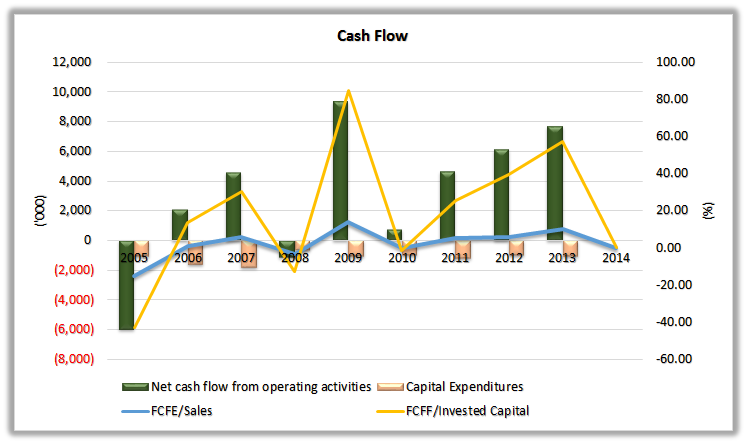 The group's operating cash flow was quite strong throughout the years. In the mean time, the group only need very minimal capex expenditures yearly (~1mils). Capex/Sales ratio was less than 3% yearly. Thus, depreciation is also low accordingly. So, it’s not hard for the group to generate positive free cash flow year and year. FCF/Sales was good. Averagely >5%. So what to do with the positive FCF every years with the dividend payout still <20% and no borrowings? Keep in the bank and waiting for opportunity. AP Oil's control on its inventory, trade receivables and payables has been quite stable at which the cash conversion cycle recorded was between 35-55 days. It takes less than 2 months for the company to convert its products into cash through sales. 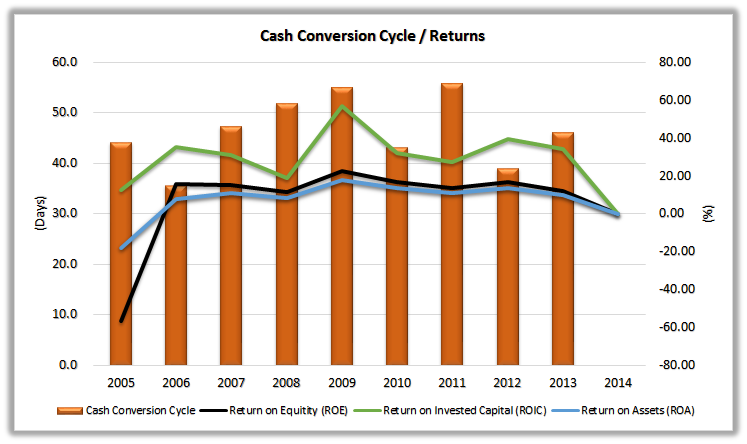 In terms of returns, ROE was above 10%, dropped to 11.7% in FY2013 due to lower profit recorded. If breakdown using DuPont analysis, assets turnover and equity multiplier had been quite stable due to stable growth of its shareholders' equities and assets. Thus, the performance of ROE highly depends on its profit margin. ROIC was quite high throughout the years, it recorded 34.3% in FY2013 which is far higher than its cost of equity which is a good thing as it generated value to its shareholders on paper. AP Oil seem like a good fundamental, sound and stable company. Will evaluate more on next post.